Two University of Utah students are redefining what it means to be beautiful. Lindsay Kite and Lexie Kite are identical twin sisters who are both PhD students in the communication department at the U of U, studying media messages and the unrealistic images of female bodies portrayed in the media. On Wednesday, Sept. 19 they held their first public presentation in Salt Lake City at Hillside Middle School. Their hope was to educate and promote a healthier body image and encourage activism through their non-profit company Beauty Redefined. From stick figure, photoshopped images on the cover of magazines to the sexualized depiction of women on television, the Kite sisters’ goals are to educate and change how women and men see and internalize beauty in the media. This one hour presentation gave valuable information and research-driven strategies to help a person navigate the world of media literacy. According to the Kites, people spend an average of 7.5 hours daily viewing media messages through magazines, internet and television. They shared that many of the images that portrayed the female body are unhealthy and represented unrealistic ideals. According to the Kite sisters, as women and girls view these media messages of beauty they often feel like they don’t measure up to the world’s view of beauty. This is how advertising works, when women feel like they need to buy the products in order to look and feel beautiful. The Kites said that the vast majority of women today feel poorly about their bodies. Six out of ten girls believe their bodies to be “disgusting” and often go to extremes to conform. This has led to eating disorders, extreme forms of fitness and surgical procedures, which are at an all-time high in Utah. Many fitness and health magazine send the message through their altered imagery that women and men have to look a certain way to be noticed. Most of these types of magazine or advertisements are focused on appearances. One issue they discussed was about being active and focusing on fitness goals rather than appearance goals. Many health and fitness magazines, they said, are some of the worst culprits. Most, if not all, of these magazines are selling products and not health and fitness. Women should be talking with their doctors and healthcare providers about what is healthy but, according to the Kites, many get their information from magazines. Last summer, Beauty Redefined sponsored a billboard campaign which they had displayed across the country with slogans such as “There’s more to be than eye candy,” and “Your reflection does not define your worth.” These billboards have had a powerful effect on communities that many people called and wrote in about how the messages impacted them. The sisters expressed the importance that women are more than just objects to be looked at. Their message was about being active and not worrying about body weight or size, which is often the dominating message in the media. They said that their program is effective because they teach people skills and strategies to deconstruct the media’s messages by asking certain questions. 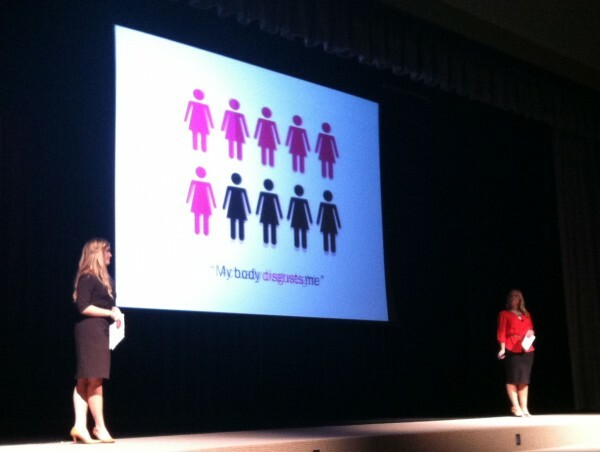 The Kites challenged the audience members to do a media fast, reject the media’s messages and write to companies that reflect poorly the representation of women. “If you can love yourself, if you can stop thinking about yourself as just something to be looked at, it will reflect on the outside, in health and beauty and confidence,” Lindsay Kite said. For more information and future Beauty Redefined presentations visit their website at beautyredefined.net or join their Facebook page.